Want to up your healthy snacking game? 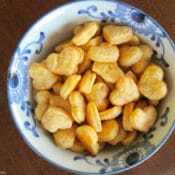 Try these easy homemade cheese crackers recipe. Homemade crackers are simple to make from scratcha nd are a great way to eliminate preservatives and unnecessary additives. Let just start by stating the obvious: I love snacks! 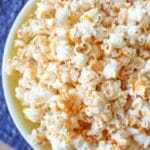 Tasty, salty, crunchy, savory snack foods are so satisfying and delicious! Unhealthy, preservative-filled, hydrogenated-oil containing, highly processed, artificially colored snack foods are nutritional disasters! What’s a snack food lover to do? My solution… make my own “junk food”! Making your own food from scratch! This means cooking your favorite foods from basic, minimally processed ingredients such as unbleached flour, meat, vegetables and simple canned goods such as tomatoes. Scratch cooking does not include the use of highly processed ingredients such as cream of mushroom soup or “meal replacement” foods such as boxed meal helpers or prepackaged bags of freezer-to-crock pot entrees. Let's be honest… prepackaged, processed foods are the norm in most American households. They are so common they are becoming ingredients for other recipes! 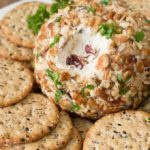 One of my food conscious friends loves to point out the ridiculousness of recipes that include highly processed food but are labeled with titles such as Three Ingredient Cookies. Here's one example. There's a popular Pinterest recipe called Three Ingredient Berry Cobbler. The recipe ingredients are frozen fruit, white cake mix and diet soda. If you've lost count, that’s 27 total ingredients in Three Ingredient Berry Cobbler! And only 6 of the ingredients can be found in my kitchen: frozen berries, flour, sugar, sodium bicarbonate (baking soda), salt, and carbonated water. Compare this to a popular Pinterest recipe for “from scratch” berry cobbler. It is made from basic, simple ingredients and contains only 7 ingredients: all-purpose flour, sugar, baking powder, milk, butter, salt and berries. Which do you prefer, 27 ingredients or 7 ingredients? Somewhere in recent American history we began to see from scratch cooking as being too time consuming and too hard to accomplish on a regular basis. 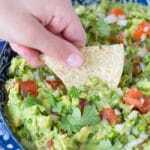 Many from scratch recipes are easy to prepare and many only take a few minutes of hands on time. So, to get back to Pollan's argument, by preparing “junk” foods yourself you can instantly make them more healthy! In the case of the berry cobbler, you are eliminating 20 unnecessary ingredients by using the from-scratch recipe. I’m not suggesting you eat homemade berry cobbler for every meal, but I do think it can be a delicious treat in your regular diet. 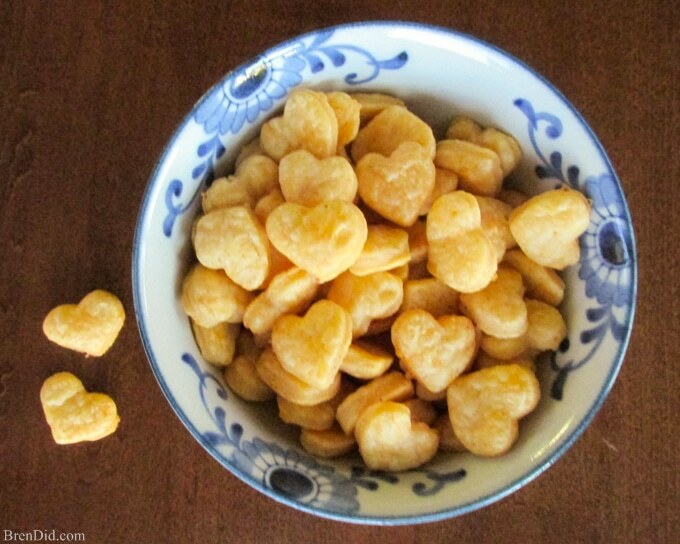 One highly processed snack food our family loves is cheese crackers. They come from the grocery store in adorable little goldfish poofs, alphabet tiles, and even superhero shapes. Unfortunately, they also come with a bunch of ingredients: 1) Enriched flour, 2) Soybean oil with tbhq, 3) White cheddar cheese, 4) Salt, 5) Paprika, 6) Yeast, 7)Baking soda, 8) Paprika oleoresin, 9) Turmeric extract, 10) Annatto extract, 11) Soy lecithin. I tried making my own chese crackers and discovered that the “from scratch” recipe uses only six basic ingredients that are already in my kitchen: unsalted butter, sharp cheddar cheese, salt, pepper, unbleached flour, and water. This eliminates 5 unnecessary ingredients! 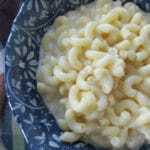 Bonus: the homemade cheese cracker recipe only takes a few minutes to prepare and is is SOOOOOO delicious! 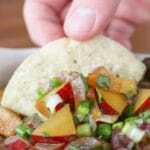 Get the full directions for homemade cheese crackers below. Need a healthy snack idea? 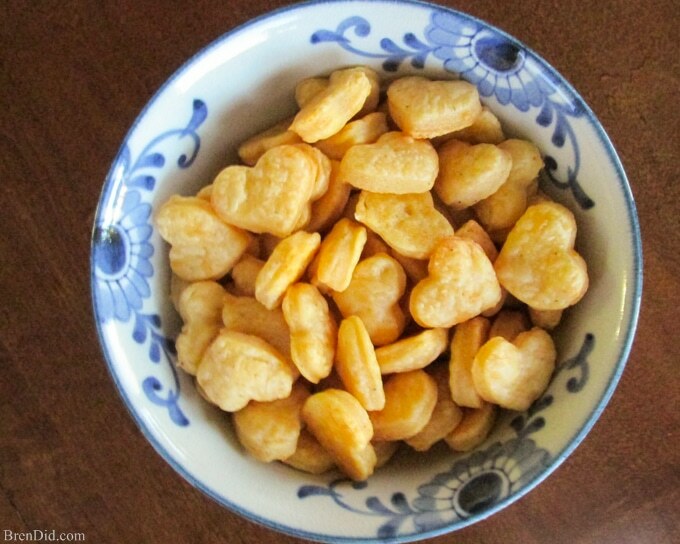 Try this easy, from scratch homemade cheese crackers recipe from BrenDid. Homemade crackers are easy to make and are an easy way to eliminate preservatives and additives from your diet. Beat together softened butter and cheese with an electric mixer. It will come together to form a soft dough of uniform color. Once the butter and cheese have been completely combined, add the salt and pepper. Next, add the flour a few tablespoons at a time while mixing at a slow speed. The dough will become very crumbly. After the flour is fully incorporated, add the water one tablespoon at a time until a pie crust like dough forms, it should not be crumbly but should not be wet. You can add an extra teaspoon or two of water if needed. Wrap the dough in plastic wrap and chill for 30 minutes. Preheat the oven to 350 degrees and divide dough into three balls. 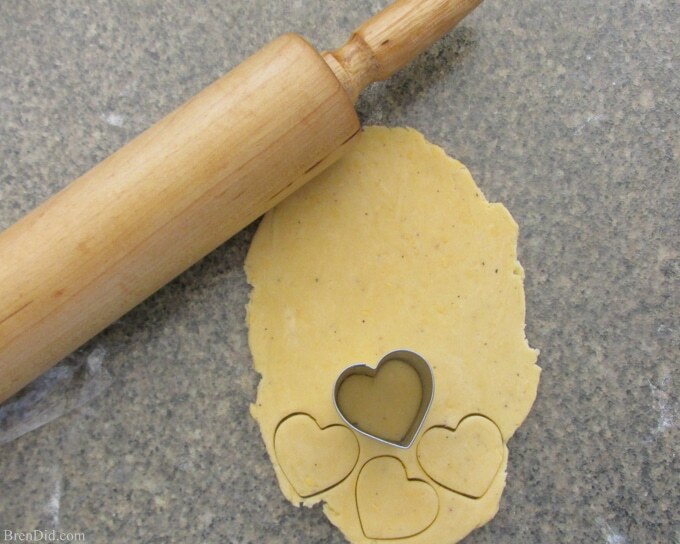 Use a rolling pin to roll one ball on a lightly floured surface until it is 1/8 inch thick. 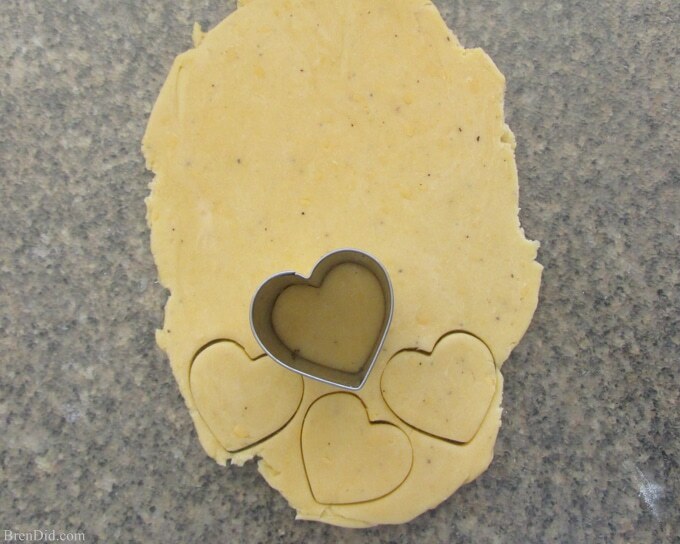 Use a knife to cut the dough into squares or a small cookie cutter to make shaper. 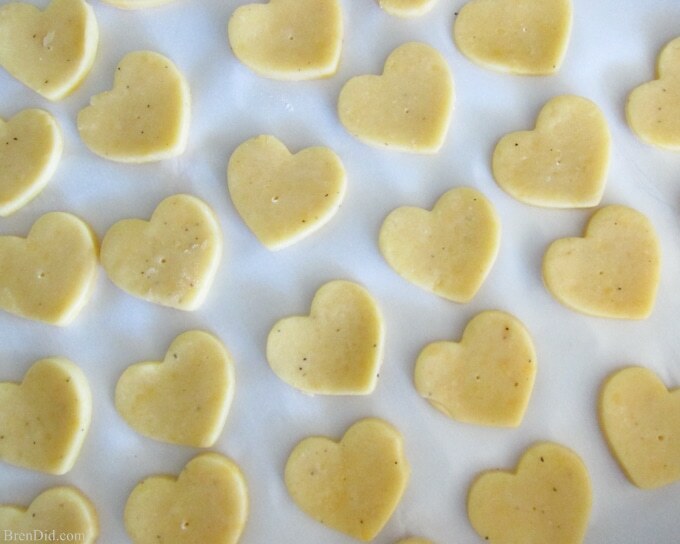 Place the crackers close together on a parchment lined baking sheet. Continue to roll and cut the dough until all the crackers are prepared. 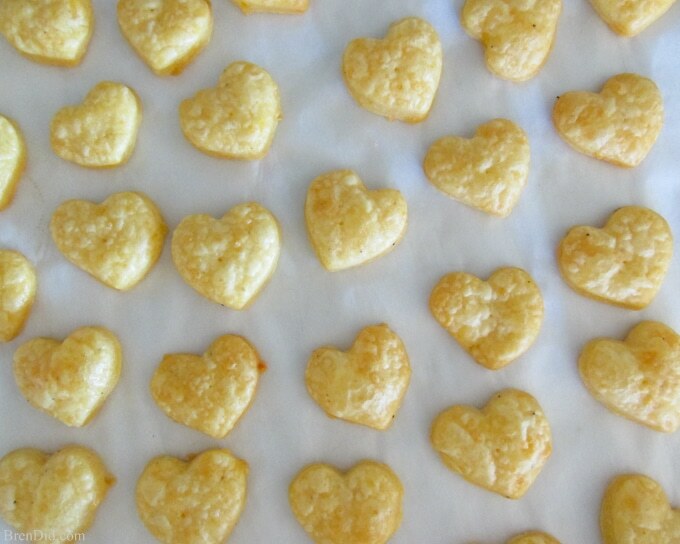 Bake the crackers for 12 to 15 minutes, they should be bubbled up, golden brown, and dry to the touch. Remove pans from oven and allow crackers to cool to room temperature before serving. I hope you try making your own homemade “junk food”. It’s satisfying to make your own snack from scratch (not to mention cheesy and delicious). Enjoy! Would it still work to use vegan margarine instead of butter? Sometimes margarine makes things too greasy but that’s all I have since my husband is lactose intolerant. I’d also be using lactose free cheddar, but that usually isn’t a problem as it pretty much the same as regular cheddar. Guess I’ll just have to try it out! Hi Jessica, I’ve never made those substitutions so I’m not sure how they will work. Let me know if you try! Thank you for this lovely recipe! I must say, though, your “prep time: 10 mins” is very misleading. Why doesn’t it include the 30 mins of chilling? 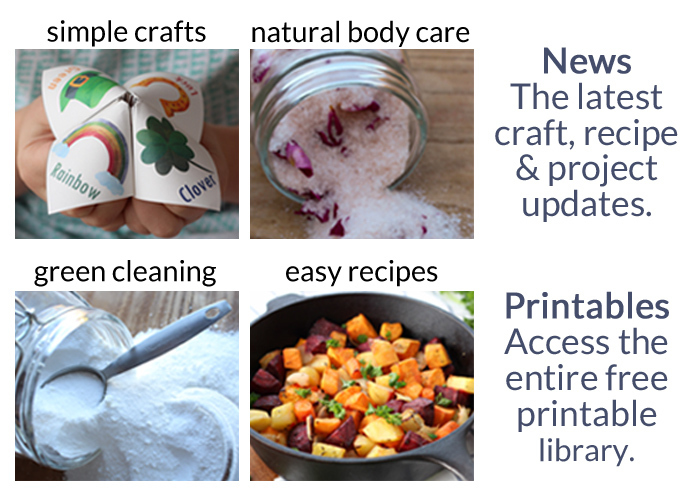 Plus, is the rolling out and using a cookie cutter and putting all those cute, teeny pieces onto cookie sheets included in the 10 mins? Because I’m pretty sure just getting the dough made is 10 mins. I would adjust the prep time to say something like “prep: 20 mins, chill: 30 mins” – then readers would know what to expect in terms of actual minutes needed to make this beautiful and delicious homemade yumminess. Glad you enjoyed the recipe, Laura. Can you substitute whole wheat flour in lieu of all purpose flour? Yes, you may need to add a bit more water to make the dough pliable. Whole wheat flowr sometimes needs more liquid than white flour. We tried this recipe tonight for a snack. It was great and something the kids could help with. 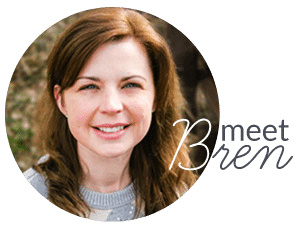 Thank you for sharing and LOVE your website! any ideas for healthier substitutes to replace the all purpose flour? I would try using a gluten free baking blend. I like the Bob’s Red Mill version. Good luck! Just made these…they’re so good! I made them for the kids, but I may hoard them for myself…with wine maybe?! I only put in 12 ounces of cheese, which worked great. I also added some rosemary. Yum! Thanks for commenting, Carrie! The rosemary sounds delicious, I will have to try that addition. these are SO easy and SO yummy! It didn’t list how many this recipe makes, and 16oz seemed like a lot of cheese, so I halved it.. got 2 cookie tins full of little hearts. It also didnt say when to add the salt and pepper, so I forgot. Maybe my cheese/butter was salty enough because we didn’t miss it. These are amazing and I’ll be making them again and again! I’m so glad the crackers were a hit! Hooray! I’m so glad the crackers were a success. They are very popular at my house too! We love cheese crackers and I didn’t realize how many yucky ingredients are in them. 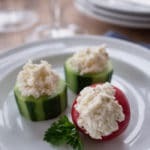 Adding this recipe to my must make list!